Lone Star Clarinet Camp is held at Argyle Middle School in Argyle, TX, and is for clarinet and bass clarinet players entering 7th-9th grades. Tuition is $150 and includes access to the camp and the camp T-shirt. Click HERE for more details. A versatile artist, Jackie Glazier is an active soloist, chamber musician, orchestral clarinetist, pedagogue, and advocate of new music. Dr. Glazier was appointed Assistant Professor of Clarinet at the University of Arizona Fred Fox School of Music in 2016. Solo performances and chamber music performances have taken her throughout the United States, Central America, and Europe. Jackie gave the world premiere of Scott McAllister’s Concerto Americana, which led to subsequent performances, including the College Band Directors National Association Conference. She also performed John Veale's clarinet concerto with the Ocala Symphony for the opening concerts of their 2016-2017 Subscription Series. An accomplished chamber musician, Jackie was selected as a finalist in the prestigious international 2016 Chesapeake Chamber Music Competition with the Cerulean Trio. She has performed as a chamber musician in the Netherlands, Belgium, Luxembourg, France, Croatia, and at Carnegie Hall's Weill Recital Hall. She is a member of the American Chamber Winds, which recently released the album, “Radix Tyrannis,” featuring trombone legend Joe Alessi. Jackie is a founding member of Duo Entre-Nous with Don-Paul Kahl, a saxophone and clarinet ensemble dedicated to the progression of new music. Duo Entre-Nous has performed internationally and commissioned several works for the repertoire from composers in North America, Australia, France, and Argentina. They are featured on the album, “Lights and Shadows, Waves and Time,” which was recently released on Parma Records. Dr. Glazier is currently working on her upcoming solo album, “Magic Forest Scenes,” which will be released in 2019 on Centaur Records. She has also recorded with pianist Tannis Gibson as well as the Arizona Wind Quintet, which will be featured on an album of the music of Hans Winterberg, to be released on Toccata Classics in Fall 2018. 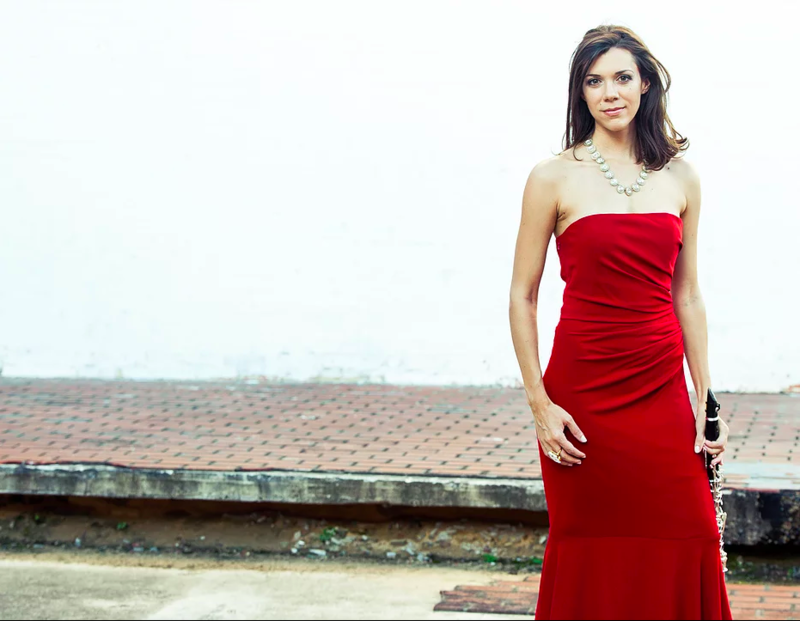 Jackie has performed regularly with the Orlando Philharmonic as principal, second, and e-flat clarinet since 2011. She was appointed principal clarinet of the Ocala Symphony, where she served from 2012 to 2016. She also performs with the Tucson Symphony and as principal clarinet of the Grammy Award-nominated True Concord Voices. Orchestral collaborations include many internationally renowned artists such as Renée Fleming, Joshua Bell, and Yefim Bronfman. Jackie was the first-prize winner of the International Clarinet Association Orchestral Competition at ClarinetFest 2014. An active clinician and educator, Dr. Glazier has presented guest master classes at major universities throughout the United States. She has earned degrees from Cincinnati College-Conservatory of Music, University of Florida, and Florida State University. Her teachers include Deborah Bish, Ixi Chen, Mitchell Estrin, Jonathan Gunn, Richie Hawley, and Karl Leister. Jackie is a Vandoren Regional Artist and a Buffet-Crampon Performing Artist. She performs exclusively on Buffet-Crampon clarinets and Vandoren Reeds. Gina Scheer founded the Lone Star Clarinet Camp in 2013 at Killian Middle School in Lewisville, Texas. Formerly a middle school band director, she is now a Vandoren Regional Artist and works with clarinet sections and band directors all over the DFW metroplex. She hold a Bachelors of Music Education from the University of North Texas. During her time at UNT she studied under Deborah Fabian, and performed with the Wind Symphony under the direction of Eugene Corporon. Jessica Dolphin is the Associate Band Director at McKamy Middle School in Flower Mound, Texas. Mrs. Dolphin received her Bachelors of Music Education from Texas Tech University and her Masters of Music in Clarinet Performance from the University of North Texas. Mrs. Dolphin has had the privilege to study with Dr. David Shea, Dr. James Gillespie, and Gregory Raden. Mrs. Dolphin can be heard on the Klavier Wind Recording Projects Allegories, Retrospectives, Poetics and Passions as a member of the UNT Wind Symphony. Mrs. Dolphin has also performed with the University of North Texas Symphony Orchestra, the Chamber Orchestra of Denton, the Garland Symphony Orchestra, the San Antonio Wind Symphony and the Lone Star Wind Orchestra. She is a founding member or the LSWO, serves as the Section Manager for the clarinet section and the Artistic Director for the Lone Star Wind Orchestra Clarinet Choir. Mrs. Dolphin has had the opportunity to perform at TMEA, TBA, WASBE, Clarinet Fest-Austin and the Midwest Band and Orchestra Clinic. Kristen Boulet is a professional clarinetist and woodwind specialist in the Dallas/Ft. Worth area. She maintains a large clarinet studio in the Southlake, Northwest, and surrounding school districts. She is a freelance artist across the metroplex on multiple woodwind instruments and has performed in various ensembles. She is an original member of the Lone Star Wind Orchestra celebrating their 10th season. She also performed with the Texas Wind Symphony for 14 seasons. Being a member of these organizations, Kristen has performed in various states across the nation and overseas in Switzerland. She is a graduate from Texas Tech University, 1990. Kristen received her BME in music education. Over the years she has studied clarinet with Jesse Youngblood, Forest Aten, Keith McCarty, Robert Wazel, Greg Raden, and Andy Crisanti. Mrs. Boulet began her career as a band director working with middle and high school students in Burleson and Lewisville ISD where her program grew to over 400 students at Huffines Middle School. Kristen is also the founder of the North Texas Clarinet Academy where she facilitates mini camps for beginners, directors and clinics for all state preparation. Within this organization she helps provide scholarships for lessons and equipment for those in need. She is also a flute and sax player which has allowed her the ability to perform in over 45 musicals in her career. Kristen has had many students make the all-state organization, go on to be performing clarinetists and music educators across the state. Kristen is a Selmer Artist and Vandoren Regional Artist, and is a member of TBS, MPE, ICA, and TMEA. Mrs. Boulet’s clinics focus on developing the total clarinetist by emphasizing the importance of a beautiful tone, solid fundamentals, musicality, and the intricate nuances of the instrument itself. She also works with many directors in developing the best clarinet sections. She does this through proper equipment choices and correct clarinet pedagogy from the beginning. Greg McCutcheon is the Director of Bands at Coppell Middle School West. He is in his 12th year of teaching overall. Mr. McCutcheon grew up in New Jersey and graduated from the Indiana University of Pennsylvania with a Bachelor’s degree in Music Education. Prior to his appointment in Coppell, he taught in Birdville, Waller and Pasadena Independent School Districts. Bands under his direction have earned numerous “Superior” ratings and “Best In Class” awards in the state of Texas including an invitational performance at the National Concert Band Festival. He was a marching member of the Raiders Drum and Bugle Corps and the 2002 DCI World Champion Cavaliers Drum and Bugle Corps. His professional affiliations include TMEA, TBA and TMAA. Mr. McCutcheon resides with his wife Kim, who is also a band director along with their dogs and cats.